Algarve Yoga popped up in 2007, when I felt to urge to share my understanding of yoga, my passion for cooking and eating good food. I had already settled in the southwestern Algarve for a couple of years (in my opinion one of the most beautiful places on earth), when I felt the need to inspire with my joy for life. Coincidently or not, it was then that a guy (web designer) came to my yoga class and offered to help me build a website... this, as part of his karma, a contribution to the world to spread yoga. With this most generous seed he helped me plant, Algarve Yoga started to grow, to blossom, to shine and, in the meantime we were a strong team of friends working together, inspiring all the beautiful people visiting us for a week and helping them aligning with the flow and vibration of the universe. My name is Diana Jost. I was born and raised in the swiss Alpes, but have always had very itchy feet, wanting to travel, to explore, to meet and share with other cultures all around the world. Years ago I ended up in the South West of the Algarve, where the amazing nature, ever changing ocean, long beaches, sunny days, relaxed vibe in the air and … it actually was that street dog (named Rusty) that followed me step by step and he completely stole my heart and made me settle, ground and not travel anymore. I feel very blessed to be living at this part of the world, where life seems to take place a bit slower, where material items mean hardly anything, where I can follow my dreams, where one of my biggest passions (teaching yoga) became my work life and of course... where there is plenty of sunshine to help me shine. Other things that make me shine (and I make sure I have time for it! ): walking my dogs on the endless beaches, singing and dancing, attending women's circles, sharing moments with my amazing friends and families, being with my son, surfing, camping out, attending connecting dancing workshops, playing the accordeon and harmonium, organizing chanting circles and most of all... just sitting, just being! 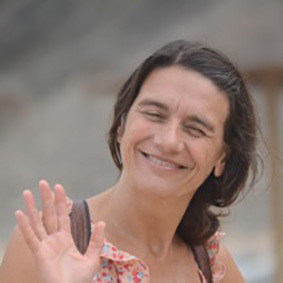 I believe the real reason for the universe leading me to Portugal was to meet my teacher Teresa Caldas, who taught me Vijnana Yoga with all it's aspects. She taught me how to do yoga effortlessly, she made me understand the poses thoroughly, she inspired me to change from muscular power to energetic power and she made me believe that Meditation is the most important practice of all. I feel honored to pass on the teaching I received from her. 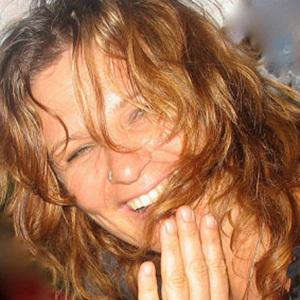 Read Vanessa's blog about me: www.lettersinyoga.com, or listen to Linde ten Broek's interview with Diana. I have been practicing yoga for 25 years, teaching for 15 years and am very confident that I can bring you a step closer towards yourself, regardless of the yoga level your are at. I would love to help you further your practice so you can journey inward to a personal pond where your potential will blossom like the leaves of the lotus flower, so you can find your true self and let your light shine. 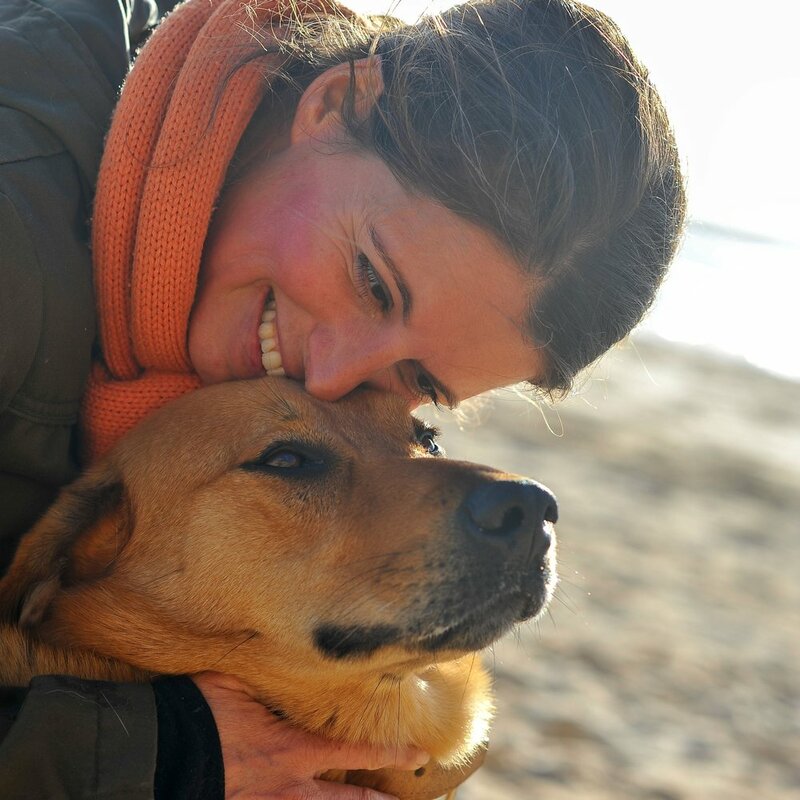 Jeanette, my head chef, a very precious friend and a big part of why Algarveyoga is so tasty http://www.jeanettetromp.com/. Romy, our porridge queen (amongst many other things)... you have not tasted a better one! Azra, with her selfless service and amazing cleaning skills, she keeps our toilets clean. Thank you so much, what an important job! Sara... you'll find her cooking in the kitchen... but puh... ih you're up for the truth, let her give you an Aura reading – life changing stuff...!!! 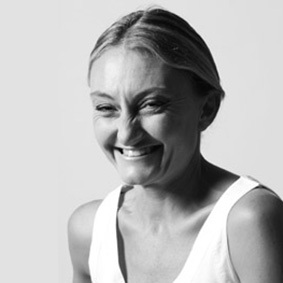 Lauren, a great friend, amazing yoga teacher with endless compassion and beautiful skills to help coming back to your heart and feel wonderful. Kathrin, a beautiful friend, a very good yoga teacher (specialized in Hormone Yoga) and a fantastic spiritual healer for all the team and whoever walks along her path. Trixi – the best massage therapist on earth! Igor... the rooster of all the chickens in the team, a great friend, yoga teacher and Shiatsu Therapist. Oskar, a very precious cuddling therapist.